Chattanooga has outpaced Knoxville in population growth since the 2010 census in the battle for East Tennessee's biggest city, but the Scenic City's rate of increase has slowed, new census figures show. And Chattanooga is surrounded by fast-growing company. Among cities in the region attracting the most people -- and some of the top ones of their size in the country -- are Atlanta, Nashville and Murfreesboro, Tenn.
Chattanooga is the second fastest-growing of Tennessee's four major cities since 2010, according to the U.S. Census Bureau. Below are July 1, 2014, population estimates and changes from 2010 census. Knoxville still leads Chattanooga in total population as of mid-2014, according to the U.S. Census Bureau's latest estimates released Thursday. Chattanooga has 173,778 people, while Knoxville has 184,281, figures show. But from the 2010 census to July 1, 2014, Chattanooga grew at a faster pace than Knoxville: The Scenic City gained 6,104 people, up 3.6 percent. Knoxville grew 5,407 residents, up 3 percent. Chattanooga's increase was enough to make it the second fastest growing of Tennessee's four largest cities in the period on a percentage basis. Chattanooga developer Eugene "Buck" Schimpf said he's not surprised. "People are moving to Chattanooga with absolutely no connection with Chattanooga," said Schimpf, who's helping develop the $100 million Cameron Harbor real estate project downtown. Chattanooga Mayor Andy Berke said there has been "an explosion" of interest in the city and "a real move" by people to relocate to the area. "A lot of factors are driving that," he said. "Chattanooga has spent a great deal of time working on our quality of life, making sure we have a diverse set of opportunities for people." Also, he said, the city's relatively low cost of living helps attract residents. 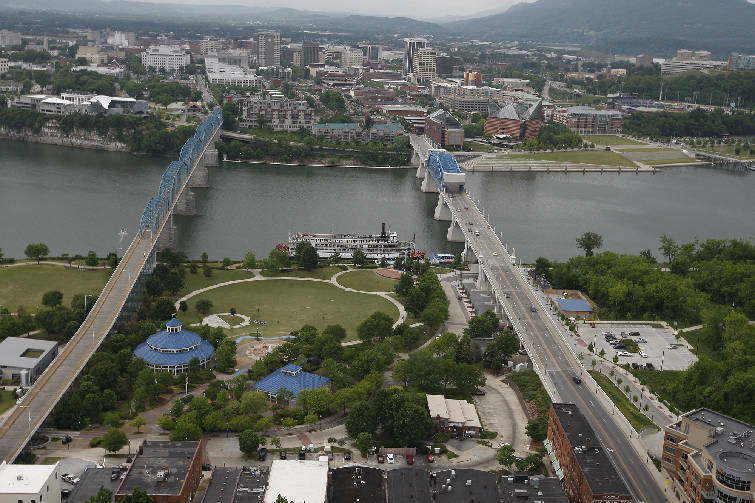 Census figures showed that Chattanooga is the nation's 141st most populous city. It's larger than Jackson, Miss., and Tempe, Ariz.
Chattanooga ranks not far behind Fort Lauderdale, Fla., and Providence, R.I. While Chattanooga's population is up, the growth rate slowed from mid-2013 to mid-2014, figures show. Chattanooga gained just 186 residents in the period while Knoxville grew by 1,365 people. Murfreesboro, meanwhile, saw a hike of 3,334 people in that 12-month period. Nashville-Davidson, whose numbers include the entire county, rose 9,144. Atlanta was up 7,593, according to the Census Bureau. Berke cautioned about putting too much into one year's numbers, but rather urged looking at the trend. For ongoing growth, he cited continuing to push quality of life and bringing "quality jobs" to the city. Schimpf said he sees the Volkswagen auto assembly plant as helping woo new residents. Earlier this year, the German carmaker started a $900 million expansion to make a new sport utility vehicle, and it plans to hire another 2,000 people above the 2,400 at the factory. "People don't fully appreciate the impact of VW," he said, citing the automaker and supplier companies. "We're just scratching the surface." Schimpf said he saw firsthand the growth that luxury automaker BMW brought to the Greenville-Spartanburg, S.C., area when it landed there in 1992. The new census figures showed New York was the nation's most populous city and gained 52,700 people during the year ending July 1, 2014, which is more than any other U.S. city. It had 8.4 million people. New York was followed by Los Angeles, Chicago, Houston, Philadelphia, Phoenix, San Antonio, San Diego, Dallas and San Jose. For the first time since Hurricane Katrina struck New Orleans in 2005, that city returned to the list of the 50 most populous as it beat out Arlington, Texas. Also, Memphis fell three positions, putting it 23rd. Nashville-Davidson was 25th, just behind Boston.